If you like taking your dog with you wherever you go, the best dog backpacks can make that even easier for journeys short and long! Whether you need the best carrier backpack for large dogs or a small harness for daily walks and hikes, we found 10 of the best dog backpacks for you and your family pet! To make sure you find the right one for your dog, here are some important features to consider when you’re looking around! Dog Size: To start, we’ll let you know the recommended size dog for each backpack: small, medium, large, etc. We’ll also let you know the recommended weight or height limits if available, so you can choose the right size for your pet! 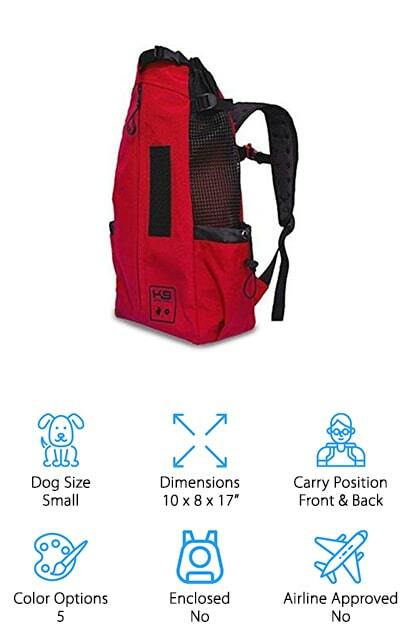 Dimensions: We found compact dog backpacks that are perfect for hiking or conveniently packing in your luggage or bag. 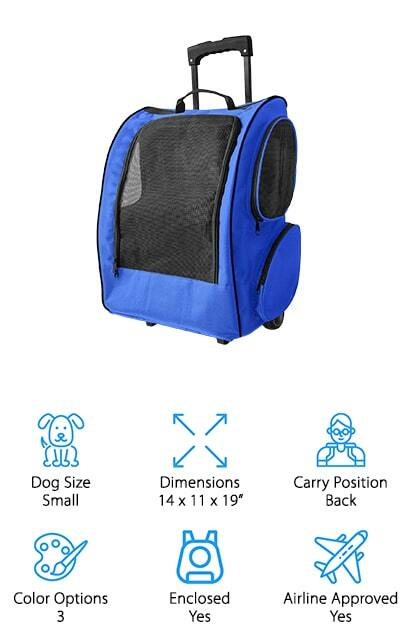 There are also larger backpacks that allow your pet to move around freely. Find the right fit for you and your dog! Carry Position: Depending on your personal preferences, we found backpacks that you can carry on your back like a traditional backpack, or carry your dog on your chest so he or she can see where you’re going. Some even work both ways! Color Options: If you’re looking for a dog backpack that matches your travel luggage, hiking gear, or personal style, we have lots of colorful options for you! You can even get a different color bag for each of your furry little friends! Enclosed: Dog backpacks come in either enclosed or open designs. Enclosed backpacks zip up completely to prevent your dog from peeking their head out of the bag. Open backpacks allow your dog’s head to poke out so they can look around. Airline Approved: Airline approved dog backpacks are the proper size to fit underneath your seat comfortably. Different airlines have their own rules about pet carriers, so always check the airline’s policies and sizing requirements before buying a backpack for your next trip! Now that you have a better idea of what to expect from dog backpacks, let’s get to the reviews! We found 10 dog backpack carriers that fit a wide range of budgets, travel requirements, and dog sizes! There are great bags for hiking, airline travel, road trips, and more! If you don’t have time to read all 10 today, that’s fine! Start with our Top Pick and Budget Pick, and then come back for the rest when you have time! Our pick for the best dog backpack carrier is this roomy and fun backpack from Texsens! We like this one because it’s spacious, easy to use, and perfect for your small pets to travel in style! This travel backpack has been approved by most major airlines, so it’s great for taking on vacation, road trips, or wherever! It opens on both sides, so your dog can go in and out however they’re most comfortable. It also has a leash clip inside the bag, so you can latch your dog in to prevent them from bolting if you open it to give them water, food, or let them out for a break. The bubble window is also a fun feature that allows your dog to look around while you’re moving, which can help with their anxiety. It also has a washable bottom liner and plenty of ventilation, so your pet feels cozy and has plenty of fresh air throughout their journey! If you’re looking for a cheap dog backpack you can take on hikes, walks, and short trips, this one from PAWABOO is great! We like the simple design of this carrier – and it comes in 8 fun colors and prints to mix things up! It’s super easy to use – just unzip the front flap, place your dog inside, then zip it back up! There are also Velcro straps to make sure your pooch is snugly inside the carrier. You can wear this as a front or rear carrier, so you can do what’s most comfortable for both of you! The mesh carrier provides plenty of airflow to keep your dog cool, and the foam barrier between your dog and you keeps you from getting too sweaty as well! 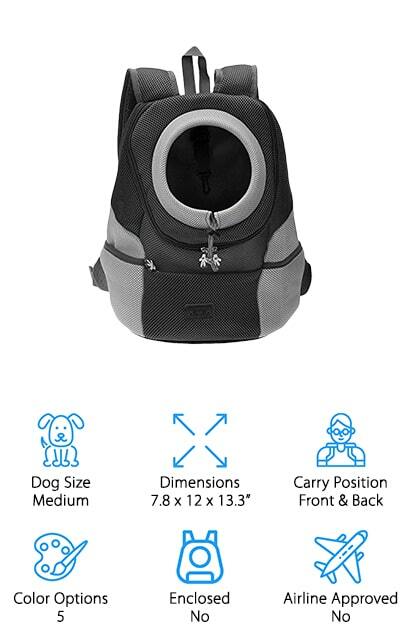 We think this is one of the best dog carrier backpacks if you just need a simple, cheap option to take your dog to the local park or on a short hike! When looking for the best dog backpack carrier for hiking, we looked for one that allowed you to bring everything your dog needs for a day on the trails. 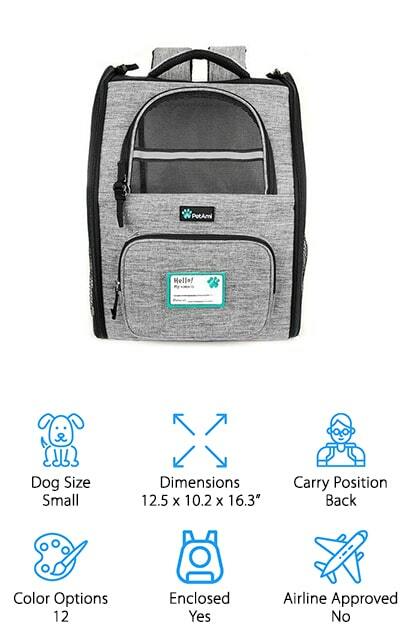 This backpack from PetAmi is great because it has plenty of space for your dog and storage for their stuff! This backpack is roomy enough for a small dog, with mesh on the top and sides to help them see and get plenty of fresh air. You can put your dog in the bag from the sides or top, or open the top vent to let your dog stick their head out! We like that this backpack also has plenty of storage, with side pouches to hold food and water, and a front pocket for poo bags, snacks, and more. It even comes with a collapsible water bowl that saves space! It’s also comfortable to carry, thanks to padded shoulder straps and extra chest and waist straps to distribute weight evenly. 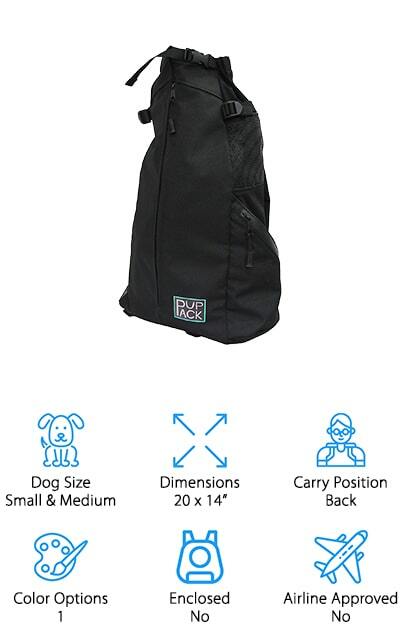 Another great backpack for taking your dog on daily errands, hikes, or trips to the park, this carrier from K9 Sport Sack is perfect for everyday trips! Instead of a harness, this is more like a mini backpack with a top opening for the head to poke out and look around! 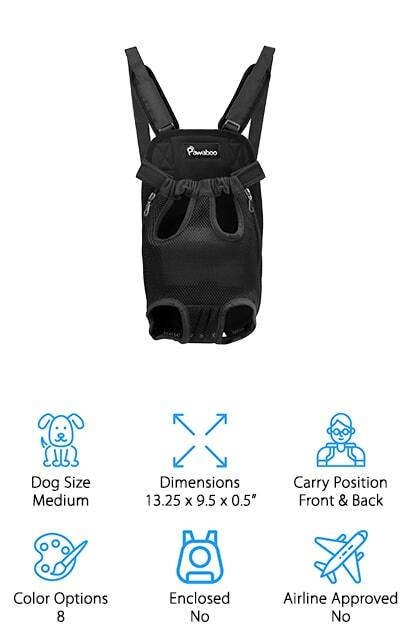 It’s great for wearing as a front or back carrier and gives your dog plenty of space to wiggle around without getting out. Just to make sure, there is a leash clip to make sure they can’t bolt when you take them out! It comes in 5 colors to choose the best one for your style, and it also comes in 4 sizes to fit just about any dog you can carry! We also like that this backpack comes with side pouches where you can store water and snacks for your pooch (and you!). The shoulder straps are padded and sturdy, with an extra chest strap for more support! When taking your dog or cat on a flight, the right backpack carrier can make your trip so much less stressful! This dog backpack carrier from OxGord is perfect for taking with you to the airport! It’s roomy enough for your pet to get comfy during the flight, and it’s airline-approved with most major airlines, so it’s easy to check in and get to your flight on time. We like that this backpack can be carried in 3 ways: as a backpack, from the top handle, or as a rolling cart! The telescoping handle and wheels make this a breeze to pull around if you’re already carrying a backpack or your back needs a break! It’s also easy to use, with lots of mesh for air ventilation and letting your dog see their surroundings. The inner pad is plush and easy to machine wash, and there are large side pockets to store extra food, snacks, poo bags, toys, and more! This large dog carrier backpack from COODIA is a great way to bring your pooch along with you on your daily adventures without needing a leash! 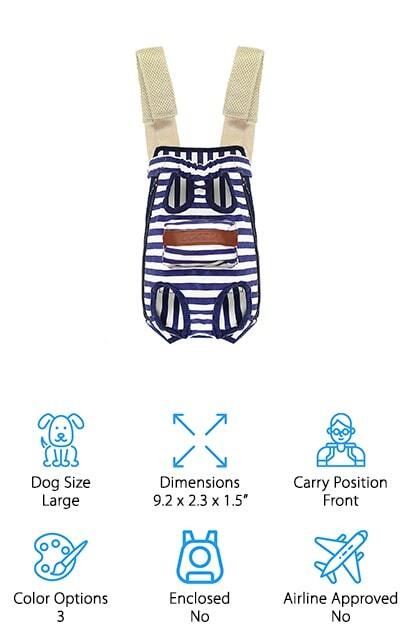 It’s a front-carrying harness that’s perfect for large dogs – though it also comes in Small, Medium, and X-Large too! We like that this super comfortable to wear, even on long days of running errands, playing at the park, or even hiking or biking! The shoulder straps can be worn as regular backpack straps, add the detachable strap for stability, or you can even criss cross them for added support for heavy dogs! This lightweight carrier is easy for your pet to get in and out of, thanks to zippered flaps and Velcro straps that keep them securely in place. It also has a small front pouch to put snacks or waste bags for your day out! 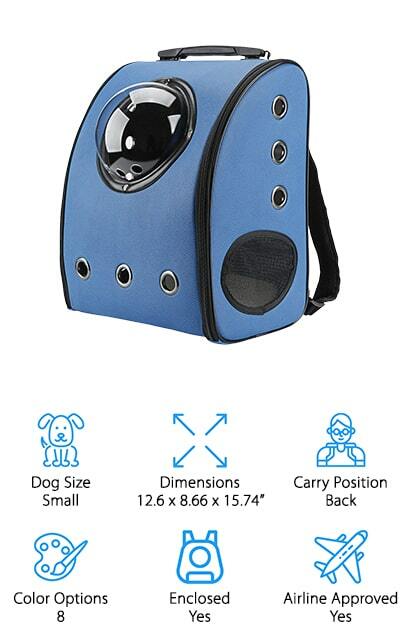 We think this is a great carrier for dogs of all sizes to go on fun adventures with you! 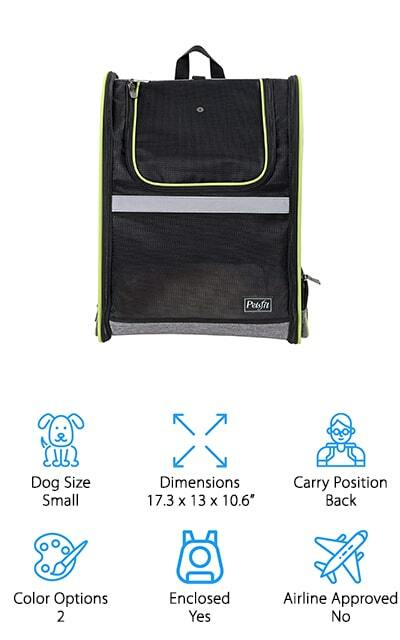 If you’re looking for the best dog carrier backpack to take on your next long road trip, we think this roomy carrier from Petsfit is great for bringing along your family pet! This backpack carrier is perfect for small dogs that weigh up to 13 pounds, and it has plenty of room for them to get comfortable. It has openings on both sides and the top, so you can place your dog in however you like. The sides, top, and front are mesh, giving your dog plenty of fresh air and opportunities to look around. You could even unzip the top to let your dog look around while you’re in the car. It’s also foldable, so you can pack it away when you get to your destination, or keep it in your car for later without taking up extra space! It has a cozy liner on the bottom, and there are storage compartments for toys, snacks, waste bags, and more! 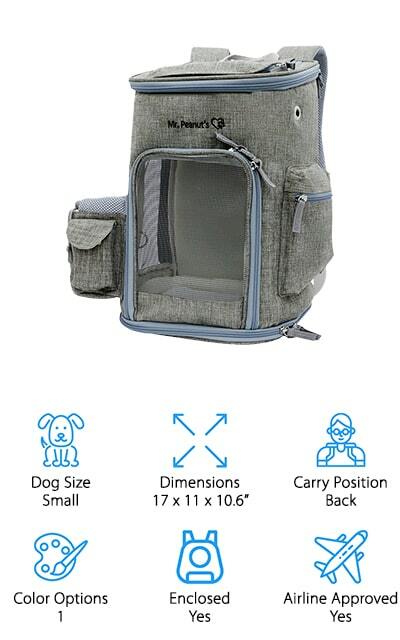 For a small to medium dog, this little carrier backpack is great for taking your dog with you wherever you go! It’s a small sack your dog sits in with a snug hole for their head to peek out and see the world! We like that this carrier fits snugly, which is great for dogs with anxiety or that need the extra body support due to disabilities or age. The head opening has a drawstring to help it fit snugly around the neck or give them more wiggle room. We like that it has a leash clip, so your dog can’t run off when you take them out of the carrier. The straps are padded and adjustable to fit straight or criss crossed for extra support, and the extra pouches are great for storing snacks, a collapsible water bowl, and even your phone! They come in 3 sizes and 5 color options to suit your pet’s size and your personal style! To take your little buddy on a plane, get a dog carrier that’s the proper size – and this one from Mr. Peanut’s is airline approved! We like that this dog backpack can be used as a standing backpack, or lay it on its side to fit underneath your airplane seat during the flight! There are 3 different openings (top, bottom, and front) for you get your dog in or out, and there’s plenty of mesh for them to see what’s going on and get fresh air. There is a hand-washable pad inside for cozy napping, and a leash ring to ensure your dog doesn’t run out when you open it to give them water, snacks, or take them out for a poo break! There is also plenty of storage for waste bags, water bottle, snacks, and more! If you want a bag that will get you and your dog through a flight safe and stress-free, pick one of these carriers! Our final review is for this dog backpack from PupPack that’s great for taking your dog with you on bike rides, hikes, and a walk around town! This carrier is great for small and medium dogs, and works like a small sack to carry your dog with their head peeking out! We like that the fabric is cooling and breathable, which is great for taking your dog out on hot days. It’s also easy to use, with a large zippered flap to get them in and out, and a head opening that’s adjustable for comfort and security. For added security, there is a leash clip so they can’t run off if they manage to escape! We also like that it has a waterproof pocket for you to store your phone, snacks, or anything else you want to stay dry! There’s also a large water bottle holder, so you can get your dog a drink of water whenever they need it!